we have hundreds of frames and mats to choose from, we have a lot of frames in stock, at special prices come in and, ask for it !!! All work Done on Premises – Our workshop is part of our store. RUSH ORDERS? Not a Problem!! 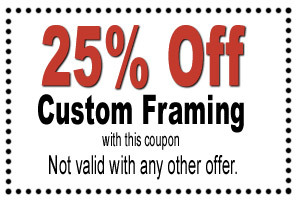 – NEED A FRAME TODAY? Not a Problem!! We carry it all.